Michael Clements makes sure the results are recorded! Well done Star Point with Jeremy Smith and Michael. 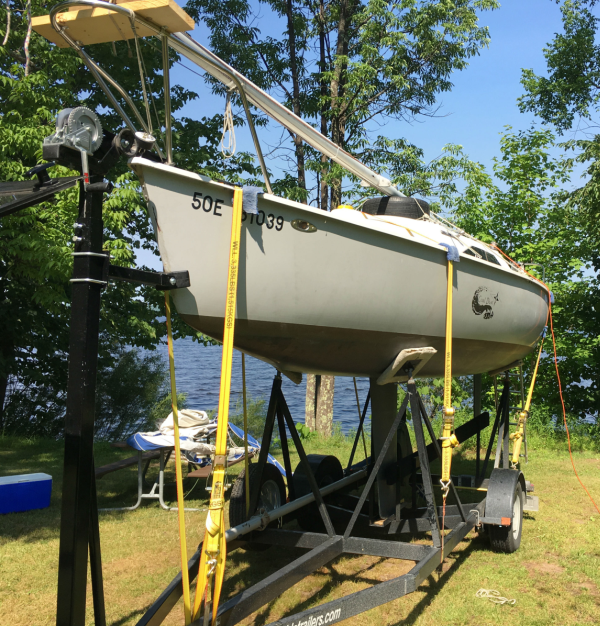 Congratulations to Benjamin Pliska, a new RVYC member, who purchased Dingo (2092) from Len DeWit on September 10. It will move to RVYC from Kits Yacht Club. Enjoy your first 242, Benjamin! The current Fleet One Champion standings, including current Wednesday Evening series (WES) at 50% weighting, can be seen on the web here. There is one throwout in the Fleet One Champion Series and the RVYC event can make a significant difference in the standings. 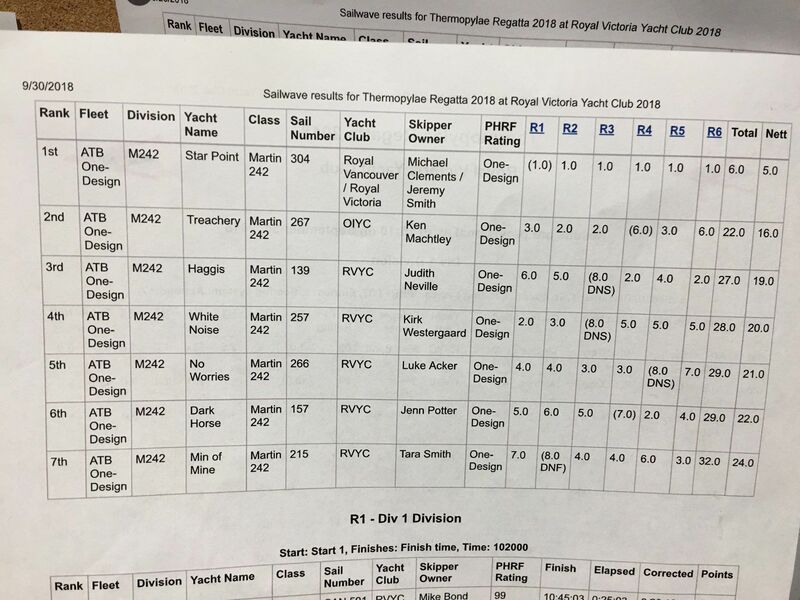 Under High Point scoring, a throwout is the lowest score, so if both boats attend the RVYC Fleet Champs, and the relative standings in the WES remain, Dirty Dog might have to finish ahead of Back in Black if more than 6 boats compete. Without a throwout, Back in Black is going into the event 3.5 points behind (38.5 vs 44). But when a throwout comes into play, the scoring changes radically. Now, BinB is ahead by half a point when each boat throws out their worst score (6 for DD, 0 for BinB). If 6 boats compete and Back in Black wins, the final result between BinB and DD would be 44.5 points to 44; BinB ahead by .5 point. In a larger fleet, BinB needs to just finish ahead of Dirty Dog. It is theoretically possible for Dirty Dog and Back in Black to overtake Too Wicked. If Too Wicked doesn't compete, and Dirty Dog wins in a 16 boat fleet, Dirty Dog could end up with 54 points (discarding the 6th from Kits), one point more than Too Wicked. And, if Back in Black also competed in the 16 boat fleet and was 2nd; BinB would end up with 15 points in the regatta with a total of 53.5 points overall in the M242 Fleet Champ series, thus knocking Too Wicked down to 3rd. Similarly, places 4th through 10th are volatile depending on who and how many show up for the RVYC Fleet Champ regatta and how the final Wednesday Evening Series (Fleet One scoring) ends up. The season isn't over. Bring a calculator. Check the current standings on the Fleet One website here. Anne and Gary Armstrong have trailored their Martin 242 Coal Dust all the way from Ontario to Nelson, BC. They reported that "The journey went well... the boat is now swinging on a mooring in Nelson. Great bunch of keen sailors here. All self- help...No launching facilities, no mast crane!" Good luck in the Kootenays!